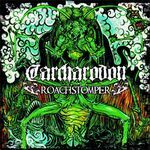 Roachstomper takes Carcharodon one step further in their search of the perfect blend between the world of extreme metal and the musical roots of blues and country music, with a strong and dominating doom / sludge feeling above all tracks. This is also the debut of second guitarist Max Iron Elbow, which joined the band in 2011, just a few months before entering into the studio to start the recording sessions of the album. The addition of a second guitar allowed the band to explore wider territories creating a huge mammoth sound.